Rattlesnakes are certainly fascinating animals, but keeping one as a pet is too dangerous for most people. Fortunately, several harmless snake species share similarities with rattlesnakes and make suitable pets. A number of species, including diamondback water snakes (Nerodia rhombifer) and snakes of the genus Pituophis, have rattlesnakelike color patterns. Additionally, rat (Pantherophis spp. ), king (Lampropeltis spp.) and milk snakes (Lampropeltis triangulum) exhibit rattlesnake-mimicking behaviors, while viper boas (Candoia aspera) and a few pythons have rattlesnakelike builds. Because they usually rely on static defenses, such as crypsis, striking and tail vibration, rattlesnakes generally bear transverse bars or blotches, rather than longitudinal stripes. Diamondback water snakes; gopher, bull and pine snakes (Pituophis spp. ); prairie kingsnakes (Lampropeltis calligaster); eastern milk snakes (Lampropeltis triangulum triangulum); corn snakes (Pantherophis guttatus); Texas rat snakes (Pantherophis obsoleta lindheimeri); and gray rat snakes (Pantherophis spiloides) all possess transverse markings and resemble rattlesnakes to varying degrees. Eastern hognose snakes (Heterodon platirhinos) are highly variable, but they occasionally bear cross markings that make them appear like rattlesnakes. Most rattlesnakes are heavy-set snakes with bulky bodies. They typically have large and triangular or diamond-shaped heads, and somewhat short tails. While this body type is very common among rattlesnakes and other pit vipers, it is somewhat rare amongst other snake species. However, a few boas and pythons have short, thick bodies and large, triangular heads. The species that is most rattlesnakelike is the viper boa, which is in fact named for its superficial resemblance to venomous snakes. Young blood pythons (Python breitensteini), Borneo short-tailed pythons (Python brongersmai) and Sumatran short-tailed pythons (Python curtus) all have short, squat bodies and somewhat resemble rattlesnakes. However, as these three species grow in length, they become much more massive than rattlesnakes. Many snakes rely on audible defense mechanisms, just as rattlesnakes do. In some cases, the sounds emitted are very similar to those produced by a rattlesnake’s tail. Most rat snakes, kingsnakes, gopher snakes, pine snakes, bullsnakes, milk snakes and kingsnakes vibrate their tails when frightened. While they're not as loud as the sounds produced by rattlesnake tails, they do often create an audible buzz as their tails contact substrate or cage fixtures. Additionally, bullsnakes, pine snakes, gopher snakes, hognose snakes and diadem rat snakes (Spalerosophis spp.) emit loud hissing sounds when disturbed. In some cases, these hisses sound just like a rattlesnake’s tail. The majority of these species also exhibit rattlesnakelike defensive postures, including drawing their bodies back into an “S-coil” and flattening their heads and bodies to make their color patterns more dramatic. Many rattlesnake lookalikes cause mistaken identifications in the wild. 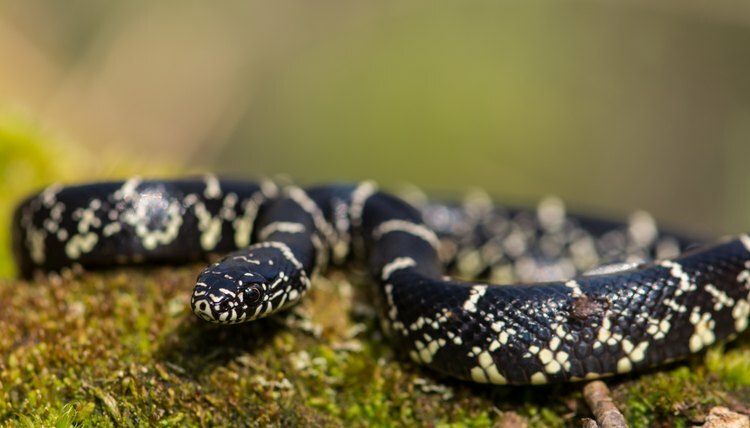 This is especially common when people encounter the tail-rattling snakes, such as rat snakes, bullsnakes, pine snakes, milk snakes and kingsnakes. While these species do not possess rattles, the presence or absence of rattles does not identify a snake with certainty; some rattlesnake populations have lost their rattles over evolutionary time, young rattlesnakes are born with only a single rattle link called a button, and individual snakes can suffer injuries, leaving them without a rattle. Additionally, several venomous species, such as cottonmouths (Agkistrodon piscivorus) and copperheads (Agkistrodon contortrix) vibrate their tails yet have no rattles. In practice, the only way to arrive at a positive identification is by learning the snakes native to your area. Never touch or interact with a snake you cannot identify with certainty.